Maximal Information Coefficient is a measure of two-variable dependence with some interesting properties. Full information and details on how to calculate MIC using R are available at exploredata.net. Here I calculate the MIC for an example (originally here) that Andrew Gelman posed on his blog. This is Gelman's proposed test data, with seed set to 42 for replicability. 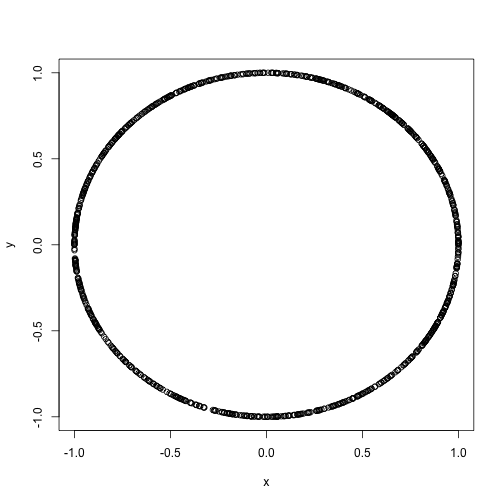 Sure enough this looks like a circle, which is clearly a relationship between x and y, but a standard correlation coefficient will not indicate this. ## Copyright 2011 by David Reshef and Yakir Reshef. ## Attribution-NonCommercial-NoDerivs 3.0 Unported License. ## 1 variable pairs analyzed. The result is that the MIC for this case is 0.6545, and the relation is highly non-linear. It isn't clear that 0.65 is the 'right' answer for a circle, but it does provide more indication of a relationship than a correlation coefficient of zero does.